XXXXXXThis gallery is dedicated to those bodies which stand out from the rest in some way or another. 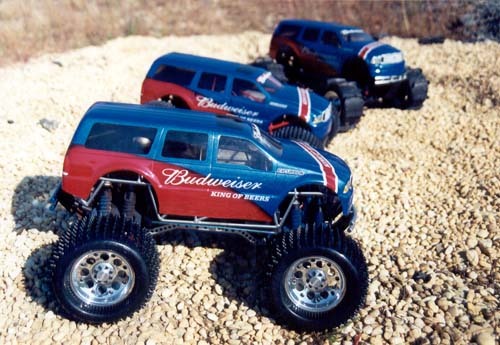 I have painted bodies for different project trucks, companies, or ones that just grabbed more attention than others. Each will have its own reason for being in here. XXXXXXTo date if you asked me what my favorite bodies are that I have ever painted I would have rambled off a few different ones. If you were to ask me now I would only have one in mind. It is well known that I am good friends with Bill at RC Alloys. We spend many of nights sitting talking online or on the phone discussing what we are working on or who has the bigger badder truck. For the past year Bill and his father have been working on a little project at the RC Alloys shop. Well, little, I guess shouldn't be the word. 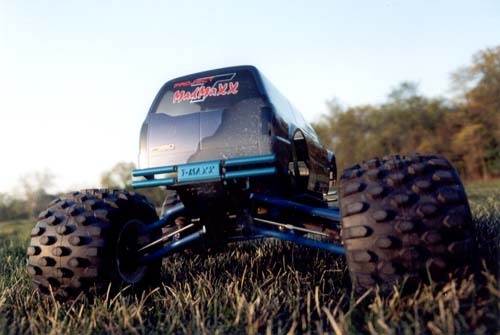 They have been fiendeshly trying to fit a two cylinder engine into a T-maxx, which is by far not a little project. One night while we were talking he mentioned he wanted me to do the body for this project. He is assured, as many of the rest of us are, that once completed this project will be magazine article material. So he decided he needed a body worth showing off. He soon came up with a request I was not sure I could fulfill. 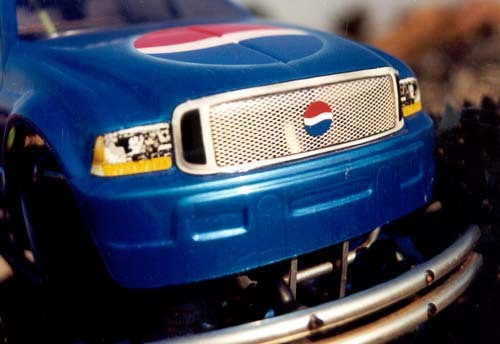 He wanted me to paint a body that looks like a Pepsi can in detail in all paint, without the use of decals. 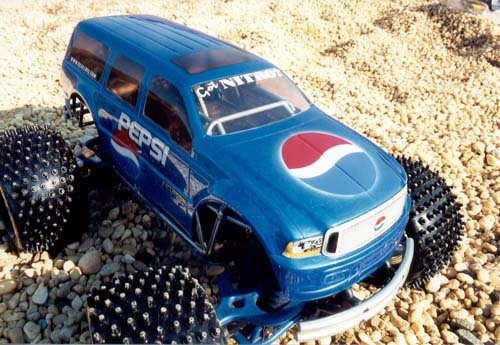 After studying a Pepsi bottle I had lying around I told him it was going to be done. Painting all the lettering details was stuff I had done before. Getting the background of the can was going to be the new part. So after experimenting with a few peices of scrap lexan and some paint I found the desired effect. Then I took some details into my own hands, as I always like to surprise people. 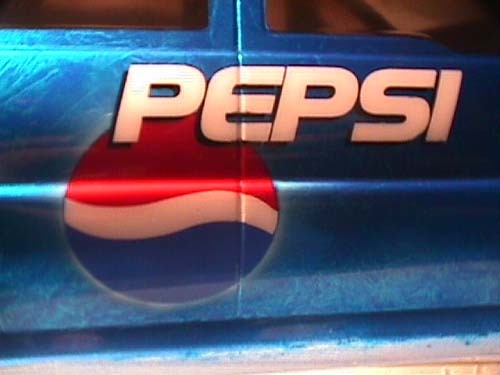 So I added my custom grille, a custom Pepsi grille emblem, Pepsi colored window tint, a Pepsi version of my license plates and then I added a new touch I had only been thinking about doing. That would be my new aluminum license plate frames. 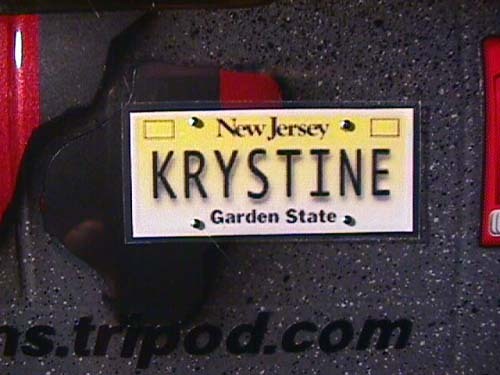 I had been selling so many license plates I wanted to go a step further. So I called upon some help from Jason Rix of Rix Gear to put my design into the works. Soon after I received some prototypes of my license plate frames. They came out great and was the perfect finishing touch to the body. The body was soon off to Bill through priority mail. Not but 48 hours later I received many great comments from him on how the body turned out. I hated to see that body go as it had become my favorite I have done. I will let the pictures tel the rest of the story. XXXXXXIf you have been to Thunder on the Beach you either know or know of Oscar from NYC, or better known as Rex01. 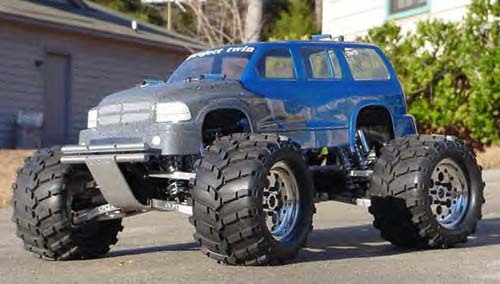 He has some of the most outstanding T-Maxxes that have been created to date. 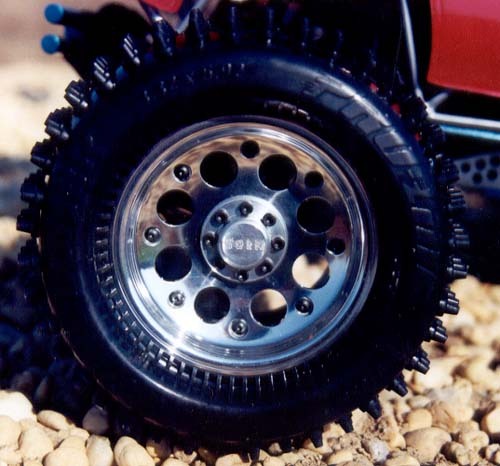 He also is the original creator of the three speed T-Maxx. You can see many of his creations at T-Maxx Unlimited. He has always had a taste for the bodies I have painted and has ordered a few over the past few years for his various RCs. Not to long ago he told me he wanted to have his three trucks get bodies that would match. He wanted something outstanding for them that would make them really catch everyones attention. 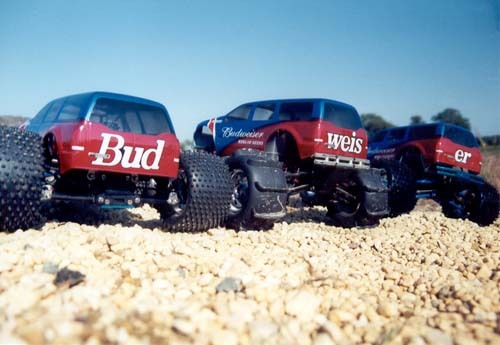 He then told me he wanted to have a Budweiser themed racing team bodies. He wanted them exactly the same in every detail except one. I won't tell you what that is as it is worth waiting to see int he pictures. Up until now I did not want to use alcoholic logos in any of my paintjobs, but this one struck me as interesting so I bent my rules for this project. 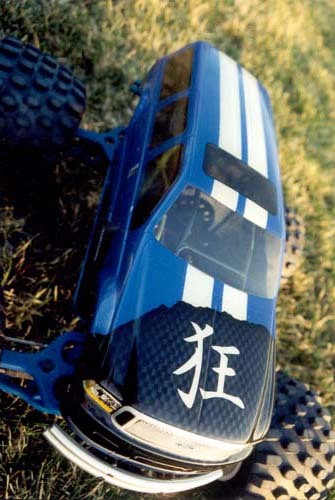 Like many of paintjobs I have doen before I wanted to do things in paint that most people would just have decals made for. 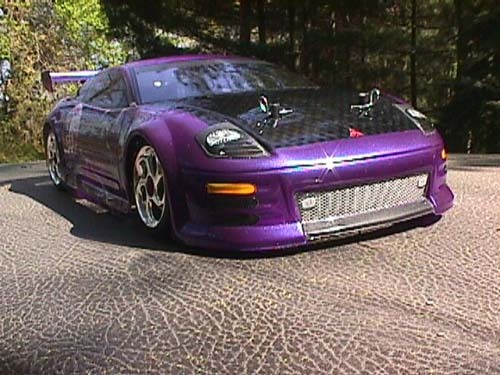 In these pictures everything you will see is paint except for the obvious Pro-Line decals. Soon afterwards Oscar received his bodies and was quite pleased as to how I put his idea into paint. XXXXXXEvery so often when the storm of orders break I get a chance to sit down and actually paint a body for myself. 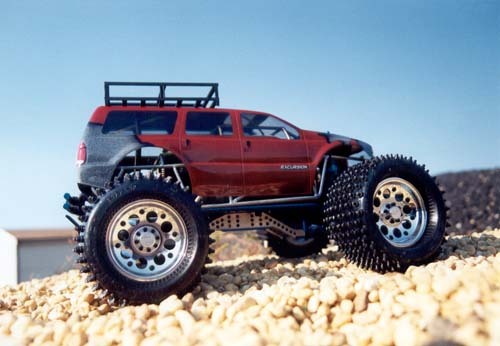 I had set aside a Pro-Line Ford Excursion for myself to paint when I got the time. However I had no idea what I wanted to paint. 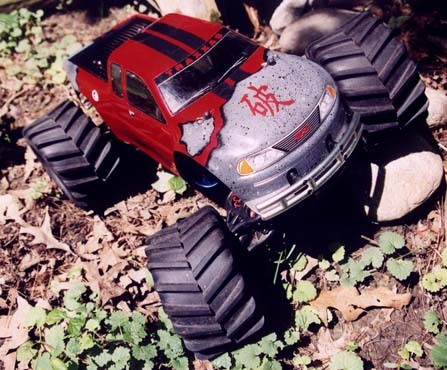 One night while cleaning shop I came across my first T-Maxx body I ever painted and in fact one of the first "Torn" paintjobs I ever did. 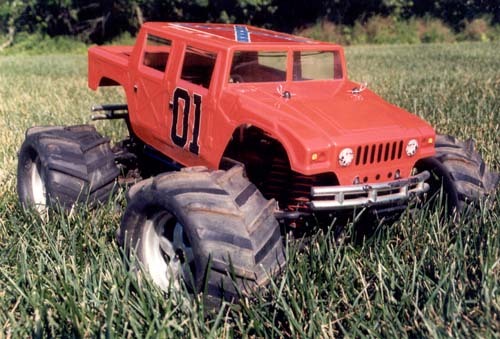 I had painted that as a show body but ended up at Thunder on the Beach destroying it. So I decided to transfer that idea onto the Excursion. Everything was to be the same except I updated a bit. Since I had painted that body I had started doing alot more detail work then I used to and I also have learned alot more words in Kanji. This new one was to be a show a body and thats it. So in other words I was going to do all the the nice touches. 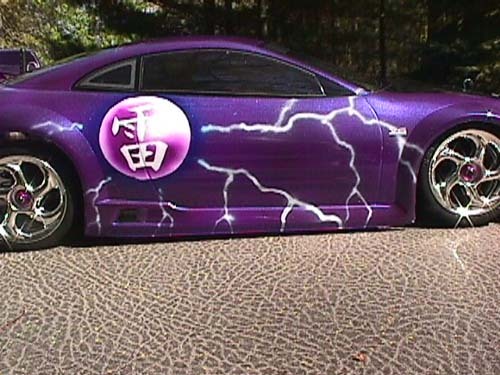 Some new added details would be the license plate, roof rack, metallice red aluminum grille and of course the updated Kanji symbol for "crazy". I was quite happy to see that body reborn as I had missed it. Rest assured this one is display and shelf use only. Also a special thanks to Bill at RC Alloys for my one of a kind wheels. He took the design I had in my head and put them into his hands and these are the end result. Check out the center caps for my logo! 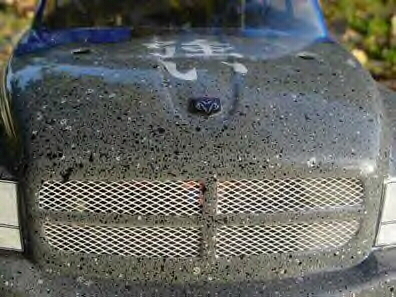 XXXXXXLast Fall I had the pleasure of meeting Jason Carter from Augusta Ga., a fellow RC enthusiast who drove up for Thunder on the Beach. 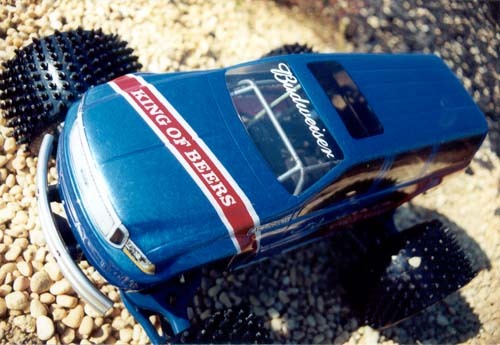 I had known him from MaxxTraxx and had also known of his love for building custom RC's. 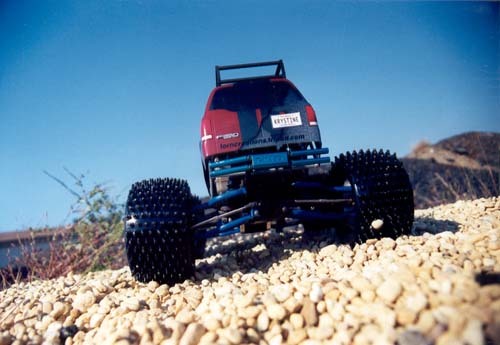 He had brought with him a twin engined T-Maxx he had built. What I didnt know is over the weekend he had aquired a taste for my paintjobs. Not to long after the show we were talking over the internet and he had told me he wanted me to paint him up a set of bodies for the project. We sat and talked for a while deciding what to go with. We came out with a design close to what I had had at the beach. I also had a few ideas in the back of my head that had been waiting for a chance to come out. I did not tell him at the time because I wanted to surprise him. 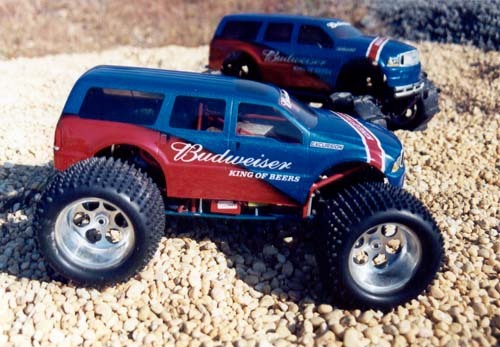 I set out to find two Parma Dodge Durango bodies. Then mapped out the whole schemes of the body. They would be two exactly alike in every detail. The only difference is one would be for bashing and one for show. 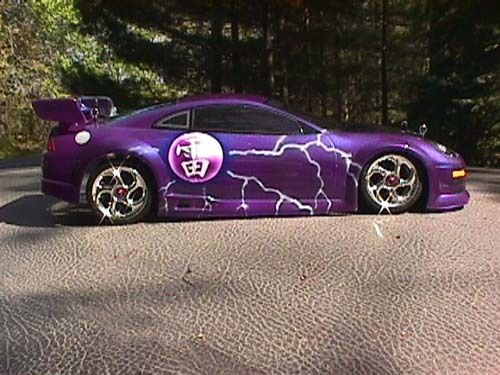 So the only physical difference on the bodies would be on the one that would be bashed had the vinyl graphics on the inside so they wouldnt be pulled off. 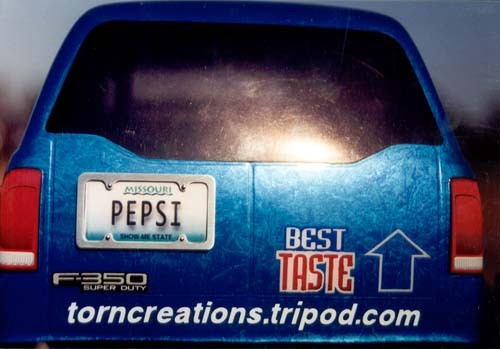 The surprises I mentioned is I had recently come across a way to make any license plate for any year of any state to scale with whatever lettering I chose and I had been toying with adding metal grilles to the bodies. Both came out great and have been utilized in many bodies since then. Jason soon had his bodies in hand and was quite pleased with them. He had pictures posted on the message board soon after and the comments flew in. 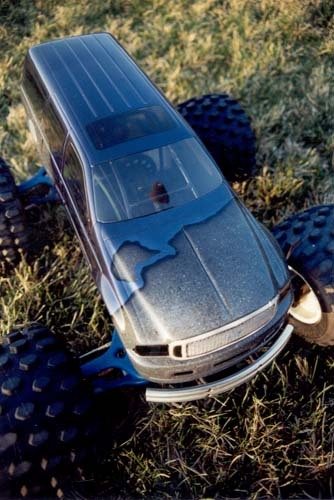 Unfortunately RC Car Action Magazine felt it was too plain of a body to have on his truck when they did a story on it. Despite Jason's thoughts they felt it needed to be a wild multi colored body. I guess we can't please everyone. I am atleast happy that Jason was happy with them and that I had the pleasure of painting a body for a well known project truck. 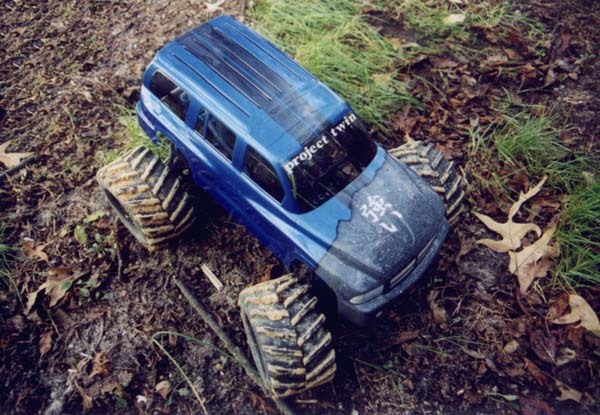 XXXXXXI was contacted by Shane at Project MadMaxx, at first a project truck which soon grew into an online RC magazine with reviews and how tos. At first he wanted a body with the MadMaxx road warrior look. I had sent him a body that was not exactly up to par with what I could really do. I guess I am not perfect afterall. lol. I had even told him before he received it I wanted to re paint it for him. When he received it he also agreed with me. 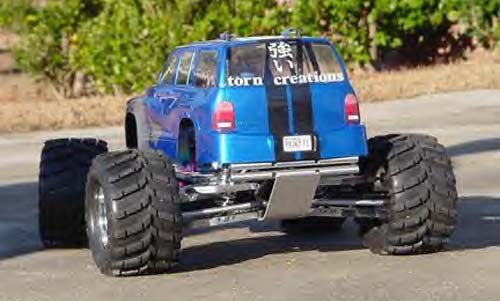 By now he had come up with some other ideas and by that point Pro-Line had released their excursion body. We decided on a new look and some new custom colors. We ended up with this and a few other custom touches for him. 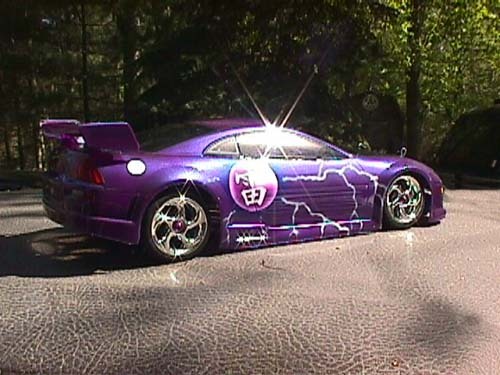 I added the custom grille, license plates, smoked out the head and tail lights and even added a tinted out sunroof. Then of course he needed his logo up on there, in which I did with custom cut vinyl. XXXXXXShane from Project MadMaxx had contacted me about sponsoring his online body contest. I jumped at the chance and offered him a Pro-Line Ford F-350 body and a fifty dollar gift certificate towards a paint job. To my surprise what I offered was the grand prize. The contest was soon over and I was contacted by Richard De Vries. 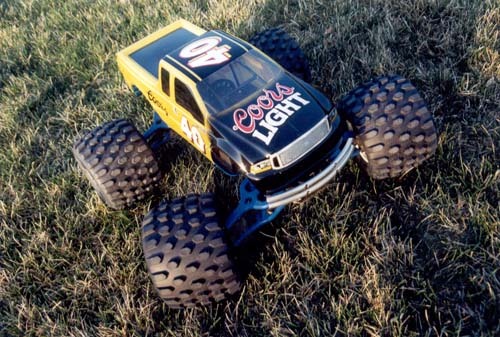 He had sent me some pictures of a Coors Light sponsored stock car. He asked if I could do a truck body that resembled it. I told him it would be no problem and I painted him one up with a black to yellow fade like on the stock car. I soon started layering down some vinyl graphics to match the logos and the numbers. This is what we ended with and soon after sending it off I was sent one of the nicest thank you notes I have received ever in my life. He commented on every detail of the body. I keep that note to this day in my portfolio of pictures. Thanks and congradulations Richard. 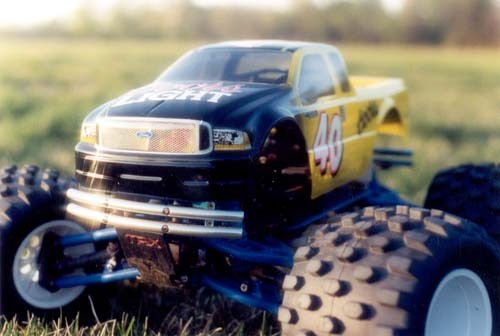 XXXXXXI had been perusing the for sale forums on the MaxxTraxx message board one night when I cam across a RcRaven roll cage. 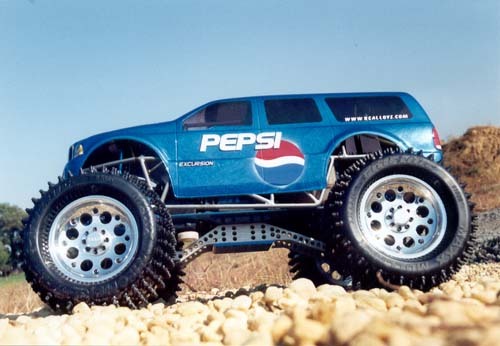 I had long wanted one but did not have the money to spend on one. 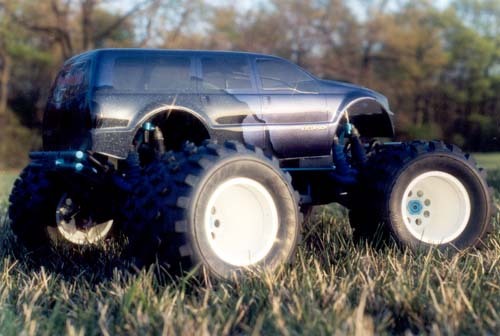 I had contacted CrazyTmaxx (Jordan) about a trade and he anxiously ordered up a custom Ford Excursion body from me. He delivered the roll cage promptly afterwards and I went to work on his Excursion body. Again I added all my special order goodies to it and sent it off to him. He was quite pleased with what he received. This however is not what really made this body stick out from the rest. He soon informed me in the weeks past that he was entering it in concourse competitions and placing. So I felt he earned a place on here. Congradulations to you Jordan and thanx for supporting me. Just remember to tell em where you got it! 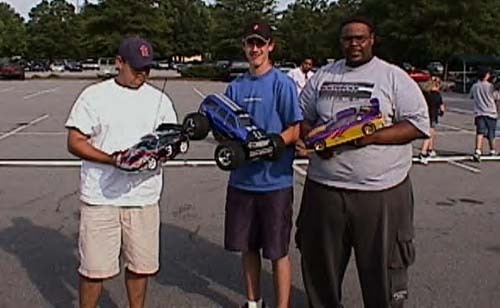 Here's a shot of Jordan with the two other winners at a recent race holding his "Torn" body. 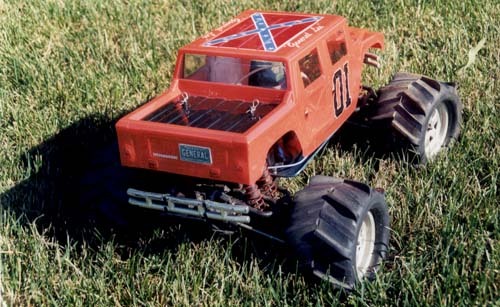 XXXXXXI had recently received an order for a replica of the "General Lee" painted on a Pro-Line T-Maxx Hummer body. 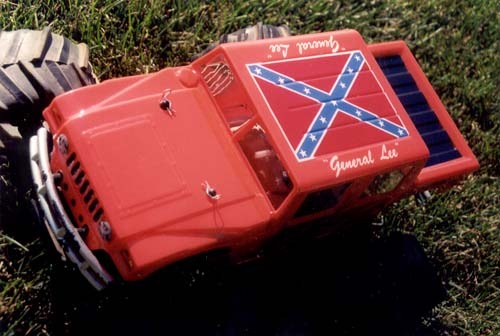 ( for those of you who dont know this was A cahrger painted bright orange with a confederate flag on the roof in The Dukes of Hazzard. Being that I grew up on this show and to this day am a large fan of theirs I couldnt wait to tackle this project. 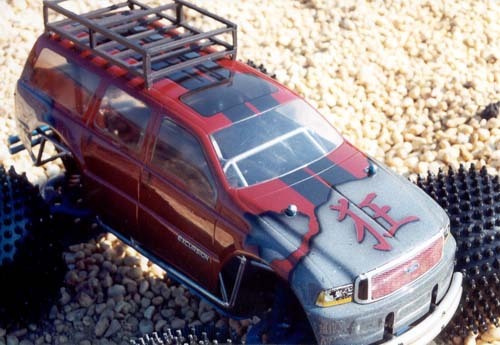 He wanted every detail of the charger I could transfer onto the Hummer body I could. I made the paint masks with the finest of precision I could. The time period nbetween completion and when it was sent I was asked by many different people if tht body was for sale and had people offer me almost double what I charged this customer. It was soon sent off to him and in conversation one night he asked if the body would be on my site. I said, "Well yeah, I don't see why not.". He said to me "Good I want to be able to show my friends my body on your site so they know you actually painted it for me.". So here you go bro. I told you I'd set you up. Now gloat all you want to them.